"A fun, teen novel packed full of paranormal powers and a sprinkling of romance. A BRONZE medal winner and highly recommended." Echo had it all--she lived in a mansion in the wealthiest neighborhood and was a member of the Partychicks, the elite high school clique. But her enviable life was ripped apart when a bullying incident put her in a coma. When Echo wakes up, she's gained paranormal powers that she can't control. Objects magically fly through the air. Lights flicker. Trees snap in half. Echo's untamed paranormal abilities wreak havoc on her life, and she will do just about anything to get rid of them. Even if it means sharing her secret with Connor, the gorgeous, frightening stranger who appears out of thin air and possesses shocking supernatural abilities. He promises to teach her things beyond her wildest imagination--if Echo has the courage to trust him. Soon, she is pulled into a world of mystical possibility and starts falling hard for the enigmatic Connor. 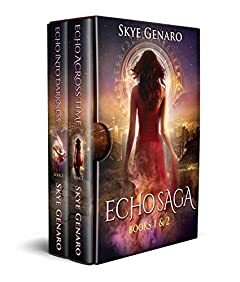 As Echo uncovers the truth about him, she discovers a dark secret brewing within her city: people with paranormal gifts are being kidnapped and murdered. Escaping with Connor would keep Echo alive, but at a high cost to him and to the future they both believe in. Echo must choose between her love for Connor and her own safety, but she can't have both. The exciting sequel to the award-winning Echo Across Time. So close to death that he could probably taste it, Connor set his gaze on his hidden audience. At a moment when most prisoners would lash out in panic, he stared down his tormentors. Behind that stormy, warring face was a tenderness that only I knew. A devotion that ran so deep, he had risked everything to search for me beyond the boundaries of time. Now, his life was in my hands. As Echo tries to piece her life together after the devastating separation from her soulmate, she finds herself in a cat-and-mouse game with bewitching criminals whose paranormal terrorism threatens to take over her city. When a frightening turn of events puts Connor's life at risk, Echo must unveil the depths of her power or lose him forever. Echo Into Darkness is a story of power, passion and deceit that will keep you turning pages and leave you breathless.